Our first real look at Marvel super-villain Thanos in Guardians Of The Galaxy proved that he was one tough cookie. OK, he didn’t really do that much other than imposingly sit on his throne, bark orders down to Ronan the Accuser, and prove that he is arguably the worst father in the cosmos. But the fact that he was voiced by Josh Brolin meant that you couldn’t help but be immediately intimated. Such a powerful and terrifying foe should surely be a once in a lifetime adversary for the likes of heroes such as Iron Man, Peter Quill and The Hulk, but Stan Lee, the creative comic-book genius behind most of the characters that now populate the Marvel Studio’s cinematic adventures, doesn’t actually believe that he is the end-all-be-all of Marvel villains. Galactus, huh? So, who is this supposedly daunting antagonist who, according to Lee, would defeat Thanos in a tussle with such embarrassing ease that you would actually end up feeling sorry for the titan? Well, for those of you who don’t read comics, he’s actually quite a big deal. Galactus, who was previously given the big screen treatment in 2007’s Fantastic 4: Rise of The Silver Surfer, is the sole survivor of the universe before the Big Bang, and you’d have to assume that if you lived through the birth of the galaxy as we know it you’d see some stuff that would make you a little bit temperamental. He is a cosmic being who passes his time traveling through space and eating planets, needing the life energy to survive. It’s not a normal diet, but you almost have to be impressed that he can devour such unfathomable meals on a regular basis. I wouldn’t want to follow him into the toilet though. As you’d expect, Marvel fans have been arguing over who could win in a fight between Thanos and Galactus for years. 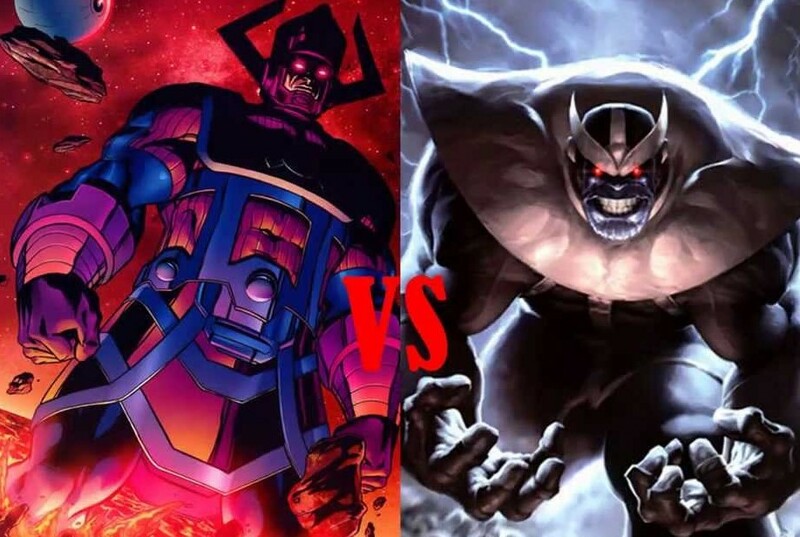 It’s generally been agreed that Galactus would be the villain who’d come out on top, as he has already done just that in several comic books – but perhaps we’ll only really know once we see the two of them go toe-to-toe on the big screen, which is something that we can all agree would be pretty bodacious to see unfold. Unfortunately, it’s not something that we may ever get to see happen, as Fox still retains the rights to the character because of their ownership of the Fantastic Four. It’s been rumored that the character has been brought up in negotiations between the two studios in the past, as a deal was considered where Galactus and Silver Surfer would have been traded to Marvel in exchange for Fox getting extended rights to Daredevil, but that never ended up coming to pass. Still, all of us comic book fans can continue to hope that someday Marvel, Fox, and Sony (the owners of Spider-Man) will figure out a way to accomplish the greatest cinematic crossover of all time. Until then, we can probably expect to see Josh Brolin’s Thanos reappear next in Guardians of the Galaxy 2, and with The Fantastic Four series being rebooted over at Fox it might not belong before we see another big screen version of Galactus (and hopefully he won’t look like a cloud this time).